When people think about landscape design, such as that that is available from Elkhart Landscape, they often think about things like hydroseeding. Others are not even entirely sure what this term consists of. Originally, it is something that is relatively easy to do and as a result, do it yourself hydroseeding has become very popular. 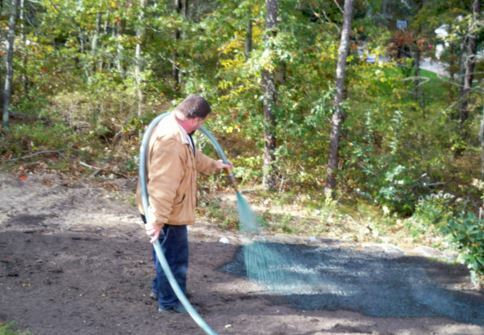 What exactly is DIY hydroseeding? It is a form of seeding that allows you to seed the entire yard very quickly, as you do it in exactly the same fashion as you would water your yard. Despite the relative ease with which you can accomplish this, there are still some important things you need to know before you get started. One of the biggest concerns that people typically have is associated with this includes hydroseeding cost. Obviously, people are concerned with hydroseeding prices because they are trying to ensure that they are getting a solid value for the money they are spending. Fortunately, this particular technique is just as affordable as some of the more labor intensive techniques that were popular several years ago. In fact, customers might even be able to get everything they need for less money because of the ease of preparation and application, as well as the speed with which one can apply the seed to a rather large area. Once the issue of cost has been addressed, individuals can focus more on things like hydroseeding preparation and hydroseeding supplies. If necessary, supplies can be obtained through a hydroseeding rental company. Most landscaping companies are more than capable of walking customers through the entire process from beginning to end. They can also provide the supplies that are required and answer any questions that the customer might have concerning any special issues associated with their particular lawn. Hydroseeding is something that can allow virtually anyone to have the yard they have always dreamed of having. It is cost effective and easy to do. In many cases, it is just the answer that people have been looking for in order to have a beautiful lawn without all the stress. There is certainly no doubt that hydroseeding is one of the best inventions that has come along in quite some time. Many people simply do not realize that it is even available. Of course, one can choose to hire the process out and have it all done by a landscaping company, this is where the professionals at Elkhart Landscape come in. As previously mentioned, most landscapers are more than happy to walk customers through everything they need to know to apply the hydroseeding successfully. Most people are simply looking forward to get better results and speed the process up. This provides the perfect platform to accomplish both goals at the same time. In fact, it gives individuals an opportunity to successfully beautify their lawn even if they don't have a great deal of time to devote to the process. That is why this particular technique is gaining so much popularity and why it will continue to become more popular in the future.